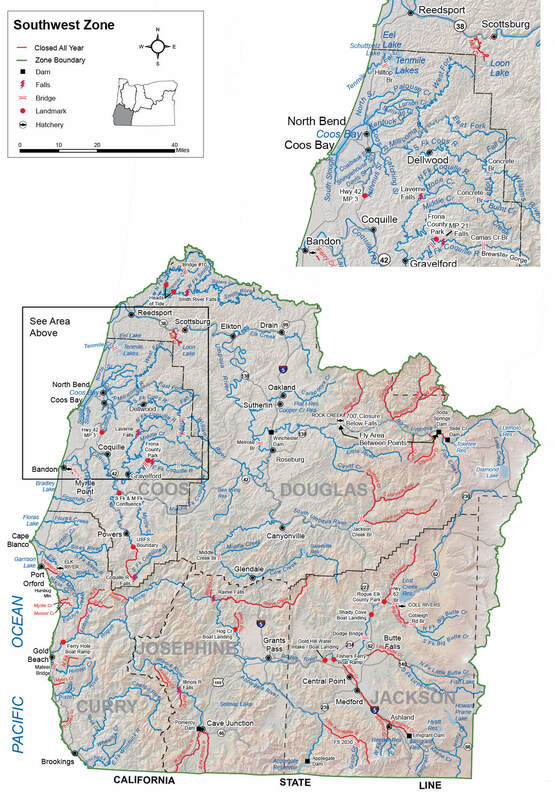 The Southwest Zone is all waters draining directly to the Pacific Ocean from the Umpqua River south to the Oregon-California border, and including, the Umpqua River drainage; and those portions of Klamath River drainage in Jackson County. Regulations for marine fish, marine shellfish and marine invertebrates are listed under the Marine Zone Regulations. From Feb 1 – Jun 30: No more than 2 wild adult Chinook per day and 10 per year may be harvested in aggregate from the Mainstem Umpqua River and the North Umpqua River. Of these 10 wild adult Chinook no more than 5 may be harvested from the Mainstem Umpqua River. Rogue River tributaries below Lost Creek Dam, Applegate River tributaries below Applegate Dam, all Illinois River tributaries, and the Illinois River above Pomeroy Dam are closed to all angling, except as noted under Exceptions. Angling in streams above tidewater for all species during May 22 – Aug 31 is restricted to artificial flies and lures. See exceptions for use of bait in Coquille,Rogue, Applegate and Umpqua river basins. Anglers may not continue to angle for jack salmon or trout after retaining limit of adult salmon or steelhead. No more than 1 adult wild Chinook salmon per day and 10 per year may be harvested in aggregate from waters of the Floras/New River, Sixes River, Elk River, and the Elk River Ocean Terminal Area. Streams: (including tidewaters and bays); 2 per day, 3 daily catch limits in possession. May 22 – Aug 31. See Exceptions where use of bait is allowed. Streams: (including tidewaters and bays): Open May 22 – Oct 31 unless noted under Exceptions. In the Coos, Coquille, Tenmile, and their tributaries, open for steelhead angling, one additional hatchery steelhead may be retained per day for a total aggregate of 3 adult fish harvested daily from Jan 1 – Apr 30 and Dec 1-31 only. See exceptions to the Chinook salmon catch limit under Umpqua, Sixes, Elk, Pistol, Chetco and Winchuck rivers and Floras and Hunter creeks. Pink salmon, sockeye salmon, hatchery coho salmon, and hatchery steelhead may be retained as part of the adult and jack salmon daily bag limit in all waters that are currently open to angling for Chinook salmon or steelhead. Hatchery releases of coho salmon occur in the Rogue River and South Umpqua River. Only hatchery steelhead may be kept, except as noted under Exceptions for the mainstem East Fork Coquille River, Illinois, Chetco, Elk, Pistol, Rogue, Sixes and Winchuck rivers and Hunter and Euchre creeks. Where allowed, no more than a total of 1 per day and 3 per year wild steelhead may be taken per year zonewide. Wild Coho Aggregate Bag Limit applies to NW and SW Zones. There is no annual limit on hatchery salmon or hatchery steelhead as long as the appropriate number of Hatchery Harvest Tags have been purchased to record the catch. Closed to the retention of white sturgeon and green sturgeon. Largemouth and Smallmouth Bass 5 per day, 3 daily limits in possession unless noted under Exceptions. No more than 1 over 15 inches in length. Streams (including tidewaters and bays): Open during trout, salmon or steelhead seasons. Bluegill, Catfish, Crappie, Other Sunfish, Walleye, Yellow Perch, Striped Bass, Sucker, Umpqua Pikeminnow, Carp, Chub, Sculpin and other Nongame Fish and Shad No limit. No minimum length unless noted under Exceptions.